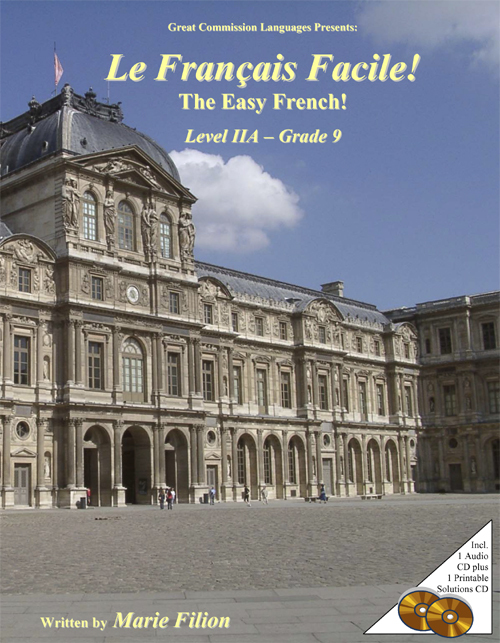 Equip your children to change the French speaking world! Includes 2 enhanced audio CD's. Put them in your stereo CD player to follow along with Marie, Chérie, François, Céline and friends as they go on various adventures. 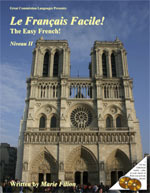 Along the way, learn about Paris, Marseilles, Québec City, and more. 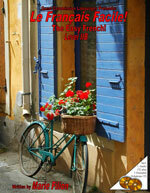 And, hear the french scripture memory verses and practice the french phonograms. Put the CD's in your computer, and you can print out free activity sheets your children can do again and again! Note that this is a 3 year program for younger students, or 1 to 2 year curriculum for older students! It has nearly 400 pages, and includes beautiful, professional illustrations. The audio CD is very impressive, recorded in a real sound studio with a professional sound engineer. Hours of post-production work went into bringing you nothing but audio excellence! 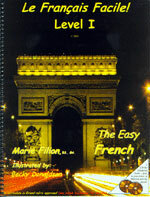 The classic format Level II has been discontinued. The replacement is our new format Level IIA and Level IIB programs (see below). 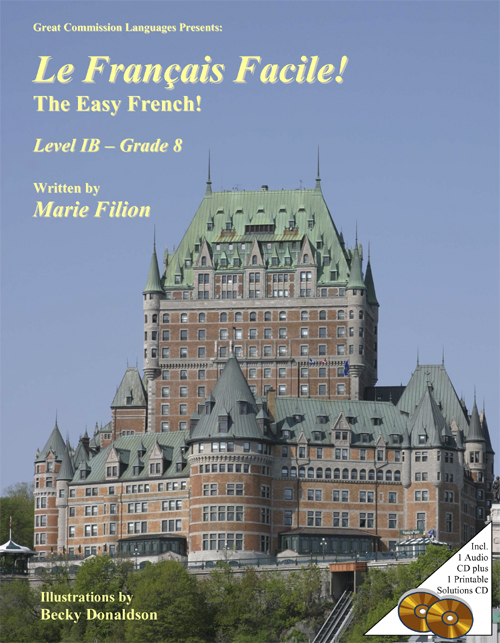 Le Français Facile! Level I was designed to be great for a family with multiple children of different ages. If you have mostly younger children though, you may want to consider the new Junior level which is targeted specifically at K-3 grade levels. It contains 34 all new lessons written to a younger audience. The character illustrations have even been redrawn as younger versions of the Level I characters (Cherie is VERY cute as a young kitten). There is more focus on the stories and songs (more new songs have been incorperated), and less focus on gramar and writing - perfect for younger children. Check out the new format! At customer request, we're making an alternative format available for purchase. 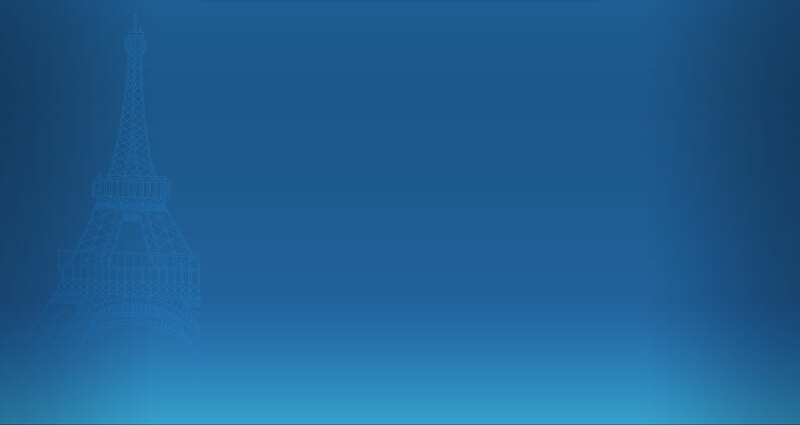 Level IA is the first half of our existing Level I curriculum, updated with a few different stories to make the program appeal more to an older audience (Grade 7 or so and up). In addition, we've integrated grammar and other exercises right in the textbook, meaning no messing around with printing out activity sheets, preparing binders, etc. This new format will appeal to those who like a more structured, step by step curriculum. All the required audio now fits on a single audio only CD; there is also a data only CD that contains the answers to all the exercises presented in the textbook. In addition, we have separate test booklets and answer keys available for purchase - see below. One other advantage to the new format is that, although Level I is less expensive than IA and IB combined, this way you don't have to spend as much in a single year, which is handy for those on a tighter budget! Note: you will need a set of the Phonogram Cards (see below) - you can reuse it throughout all the levels though. Check out the new format! At customer request, we're making an alternative format available for purchase. Level IB is the second half of our existing Level I curriculum, updated with a few different stories to make the program appeal more to an older audience (Grade 8 or so and up). In addition, we've integrated grammar and other exercises right in the textbook, meaning no messing around with printing out activity sheets, preparing binders, etc. This new format will appeal to those who like a more structured, step by step curriculum. All the required audio now fits on a single audio only CD; there is also a data only CD that contains the answers to all the exercises presented in the textbook. In addition, we have separate test booklets and answer keys available for purchase - see below. One other advantage to the new format is that, although Level I is less expensive than IA and IB combined, this way you don't have to spend as much in a single year, which is handy for those on a tighter budget! Note: If you don't already have it, you will need a set of the Phonogram Cards (see below). Check out the new format! At customer request, we're making an alternative format available for purchase. Level IIA is the first half of our existing Level II curriculum, updated to make the program appeal more to an older audience (Grade 9 or so and up). In addition, we've integrated grammar and other exercises right in the textbook, meaning no messing around with printing out activity sheets, preparing binders, etc. This new format will appeal to those who like a more structured, step by step curriculum. All the required audio now fits on a single audio only CD; there is also a data only CD that contains the answers to all the exercises presented in the textbook. In addition, we have separate test booklets and answer keys available for purchase - see below. One other advantage to the new format is that, although Level II is less expensive than IIA and IIB combined, this way you don't have to spend as much in a single year, which is handy for those on a tighter budget! Note: If you don't already have it, you will need a set of the Phonogram Cards (see below). 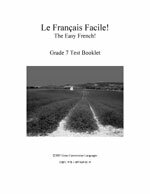 Le Français Facile! Level IIB - New! Check out the new format! At customer request, we're making an alternative format available for purchase. Level IIB is the second half of our existing Level II curriculum, updated to make the program appeal more to an older audience (Grade 10 or so and up). In addition, we've integrated grammar and other exercises right in the textbook, meaning no messing around with printing out activity sheets, preparing binders, etc. This new format will appeal to those who like a more structured, step by step curriculum. All the required audio now fits on a single audio only CD; there is also a data only CD that contains the answers to all the exercises presented in the textbook. 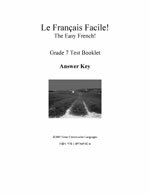 In addition, we have separate test booklets and answer keys available for purchase - see below. One other advantage to the new format is that, although Level II is less expensive than IIA and IIB combined, this way you don't have to spend as much in a single year, which is handy for those on a tighter budget! Note: If you don't already have it, you will need a set of the Phonogram Cards (see below). French Phonogram Cards on Cardstock - New Lower Price! 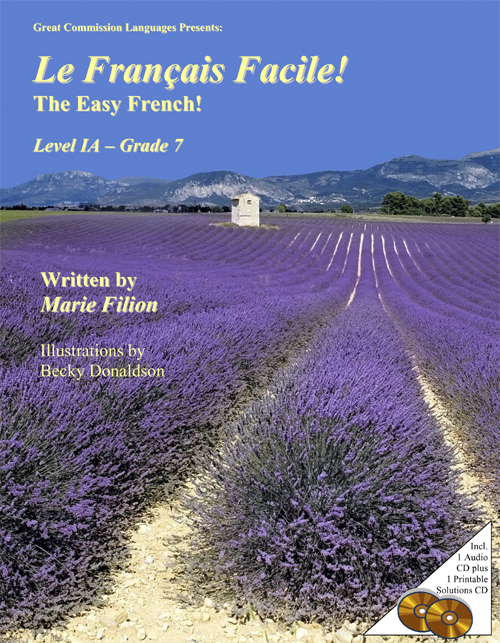 The French Phonogram Cards are included in the back of Le Français Facile! Level I, but they are on regular 20lb paper. At the request of many of our customers, we are now offering them as a separate item on heavy cardstock. They are larger than the ones in the textbook, easier to work with, and you don't have to cut them out of your book. The phonograms are NOT included in Level II or any of the new format textbooks. There is no extra shipping to add this item to your purchase of any of our textbooks.